A Smokey Business in Kaliasin | What an Amazing World! Red, spicy and addictive. Sambal Panggang Pe (smoked ray covered with ground chili paste and spices) look not only visually appealing, but also menacing to some for its generous spread of chilies. 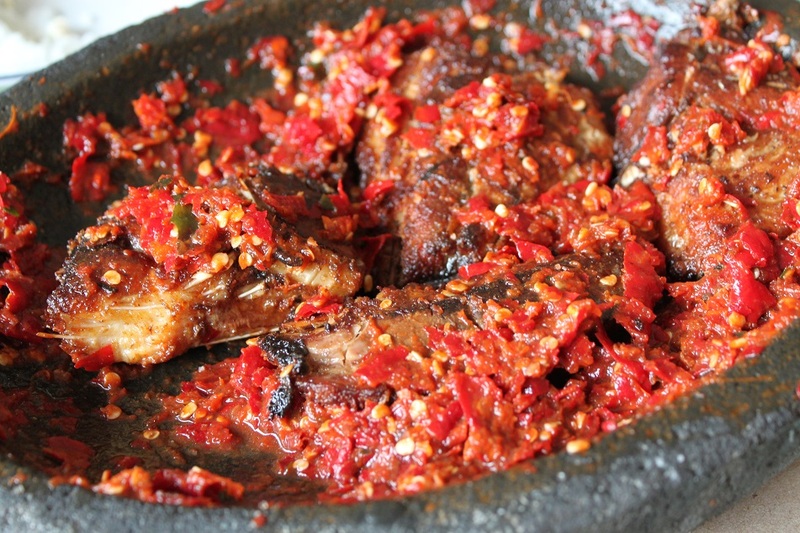 Widely available throughout Central and East Java, Sambal Panggang Pe is highly popular among Javanese but curiously less-known to others in a country where chili is adored. 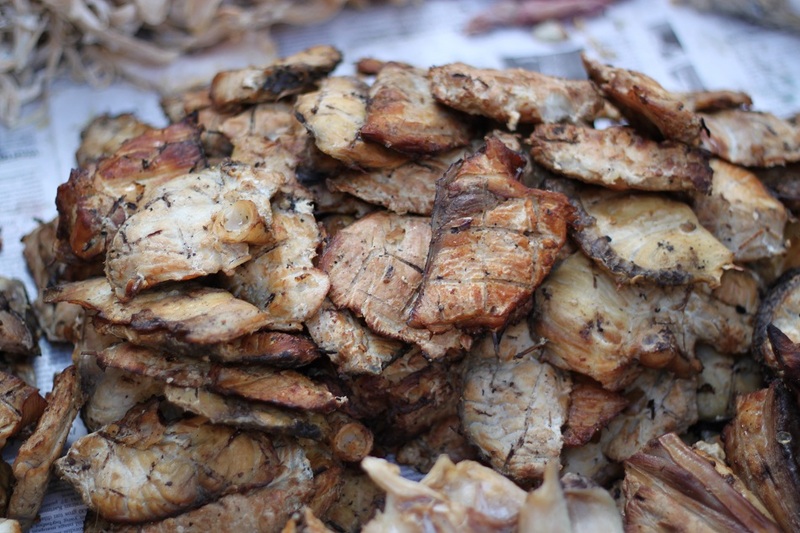 Coconut shells and husks are used in the smoking process, creating a distinctive flavor to the fish. That and the keffir lime-infused sambal make a solid spicy dish favored by many, despite the tropical heat and humidity in Indonesia. People think sweating while having spicy dishes actually refreshes their bodies. As a sambal lover herself, my mother often makes the dish at home, successfully converting my father into a spicy food enthusiast, even though his stomach sometimes does not cooperate. Smoked ray is not hard to find at traditional markets in my home town, enabling people to prepare the dish at anytime all year round. However many don’t realize the long process the smoked fish underwent before reaching those markets. 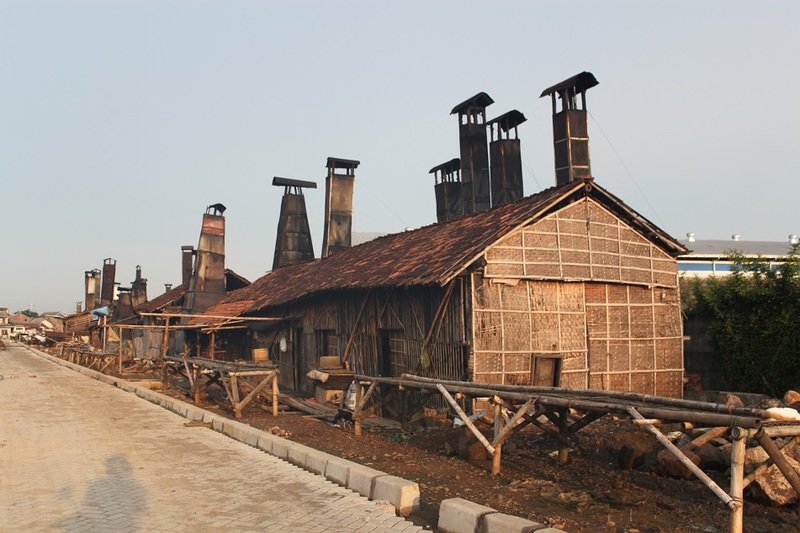 “I’m going to Kaliasin to see the smoke houses,” I said one morning to my father. “But the area gets rob often,” he replied, voicing his concern of the frequent salt water intrusion in Semarang’s northern districts, a perennial problem in the city since a long time ago. However some research made me confident enough to explore the area, on a motorbike instead of a car. Weaving my way through small roads with potholes and patches of dirt, I passed by modest houses in this impoverished part of the Central Javan provincial capital to get to Kaliasin. Behind dilapidated houses and a dirty river lie luxurious housing estates, an area some of the city’s richest people call home. I meandered through the paved street along the river – once a dirt road until the recent improvement funded by the city government – to get to the smoke houses. Soon enough rows of chimneys, made from metal and darkened by silt, emerged as the river bended. Their reflections on the calm water created a bizarrely scenic view in the otherwise run-down neighborhood. 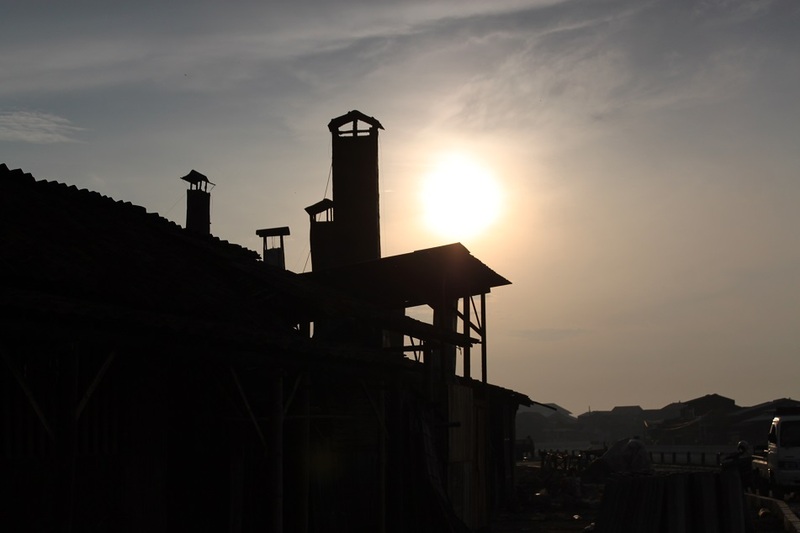 It was 6 am and the sun had already started warming up the sleepy smoke houses, no workers yet, only cats. Daily activities usually start a few hours later, beginning with suppliers dropping fresh fish to the smoke houses, commencing a chain of process to prepare ready-to-sell products. Cleaning the fish is usually the first thing the workers do at the smoke houses where they are later cut into small pieces. Then they are pierced with small wooden skewers to prevent them from falling apart during the smoking process. The next step is the most crucial in the entire process: the smoking itself. The quality of the finished product relies on the quality of the coconut husks and shells, as well as the workers’ skill to ensure all the fish look evenly brown but not burned. Then finally they will be sent to traditional markets to be sold to customers, and eventually end at dining tables throughout the city and beyond. As the sun rose higher I started the motorbike engine, breaking the silence in the small-scale and labor-intensive industry setting. People don’t make a lot of money there, but their work results can be found beyond the city proper, bringing nostalgic memories to many who miss home and crave for a fiery fix. They create happiness despite lacking of possessions which would normally make many of us happy. But perhaps what the workers have in mind is only how to make ends meet after all. Thank you. It was such a beautiful morning, hence the soft golden hue on those smoke houses. That particular dish was indeed very spice even for me. However I strongly recommend it for anyone visiting Semarang. I love those wonderful metal chimneys, Bama – you can just imagine shots of them at sunrise and sunset with their reflections in the river. Maybe we should try and document the process (from port to table) when I visit Semarang in the future. That would make for a stunning photo essay! Those rusty chimneys are indeed the most interesting feature of the neighborhood. And you’re right, it would be so amazing to document the entire process, which means at the end of it you’ll have the dish to try! 🙂 It’s actually of of the dishes I always miss from Semarang, apart from lumpia of course. wow….this is one delicious post! I always drool every time I see photos of dishes with sambal. It’s one thing I cannot live without. 🙂 Thanks Deb! Trying it won’t hurt. 🙂 But before that, make sure you order cold drink as an antidote to the fiery dish. First time I received email notification about this ‘Kaliasin’, I thought it was Surabaya’s Kaliasin who also selling meals and food rolling carts along the Kaliasin’s street beside the locals famous Plaza Tunjungan. Then I finished reading this posting. Then it is Semarang’s Kaliasin. I’ve been to such place (smoke houses) because I was living nearby. 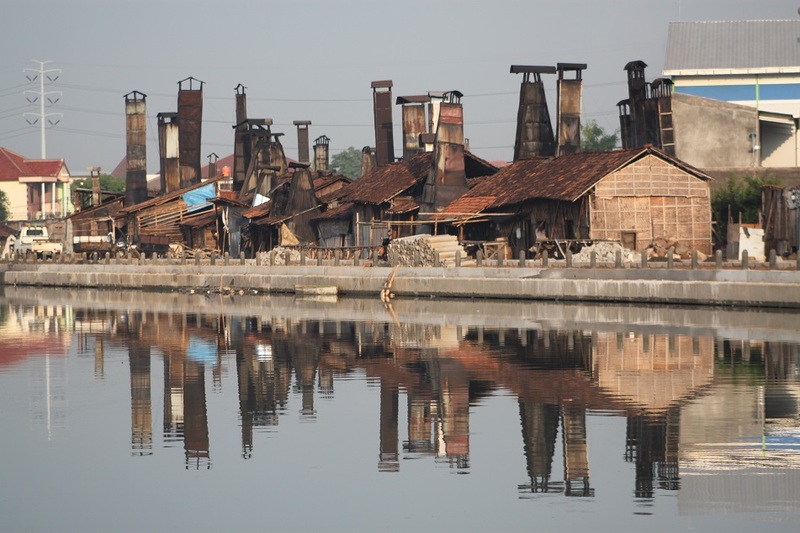 Contrary with smoke houses in Semarang, they smoke the rays, other fishes beside train’s railway in Surabaya. There are a few ‘smokers’. Mostly are Madurese people who run the business. I don’t know if any smoke house in Surabaya. And there are several kind of fish they are selling. From full of bones fishes until meaty fishes. I’ve read an health article about this smoke fish is not good for health in a a long run, because the charcoal left in the fish. I didn’t know about a region with the same name in Surabaya. Thanks for the brief info! About the health issue, it shouldn’t be something to worry about with the smoked fish in Semarang because they don’t have that crusty burned part as they are smoked, not grilled. Smoking is in fact one of the oldest food preservation techniques humans use. Nyemplang tuh apa ya? Beneran baru denger istilah itu. 🙂 Yang pasti itu bikin nagih. Bukan nyemplang, tapi nyampleng. Nyemplang itu jalan yg berlawanan arah :). Fotonya bagus. The image with Smoked Rays caption looks like mushroom. Yummy. Beautiful pictures! It looks and sounds so delicious! Thank you! There is a toned down version of the dish which most people can enjoy. The distinctive smoke flavor of the fish is something not to miss. You are absolutely right, Bama. Chilli is an integral part of most of our dishes. But there are different varieties of chillies and in my home we prefer the least spicy one. I have some Sambal Oelek in my fridge. Used it this week in one of my dishes. Is that the same Sambal? Sambal Oelek, or in present-day pronunciation called sambal ulek (literally means ground sambal), is probably the most common type of sambal. 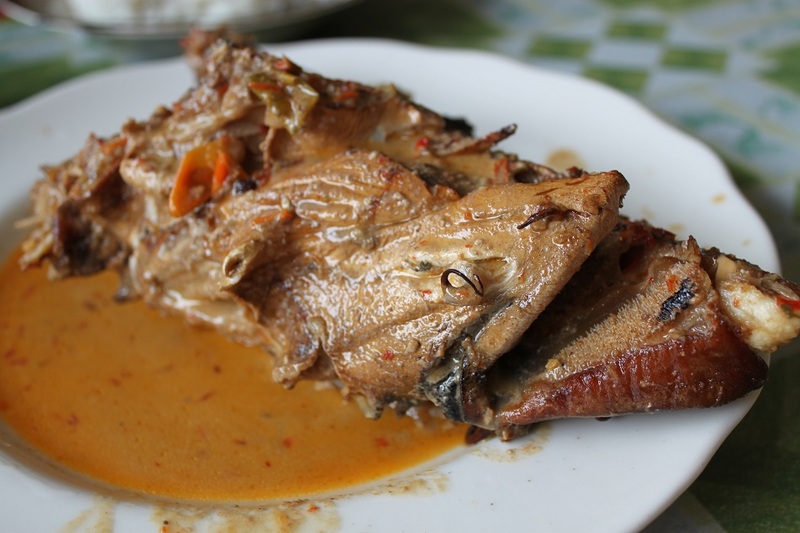 The one used in Sambal Panggang Pe has a slighly tangy flavor which blends very well with the smoke flavor of the fish. OK, you had my mouth watering within the first two sentences and then I saw the photos. I had just finished eating when I read your post and now I am hungry again! LOL! Thanks for sharing! Ah, I didn’t know this post could do just that to some people, including you. 🙂 Well, if you love spicy food and smoked fish, you might find the dish very addictive should you try it yourself one day. How long is the smoking process? A few hours? All day? I always love smoked fishes, but cannot stand any hot sambal. But seeing your pictures makes me want to give it a try. Is there any sambal panggang Pe sellers in Jakarta? Actually I haven’t found any restaurant in Jakarta with Sambal Panggang Pe on its menu. But I’ve tried smoked ray from Jakarta and Semarang, and the latter tasted a lot nicer. Saya nggak akan bisa makan tanpa sambal. Bagai sayur tanpa garam. Anyep, hehehe. Iya. Yg penting ada rasa pedasnya hahaha. The Smoked Ray with Sambal looks seriously good Bama!!! Fab photos of the smokestacks too. Only for those who love spicy dishes, and who like to try interesting things in life. I believe you belong to one of them, or even both. 🙂 Thanks again Madhu! Ah tidakkkkkkkkkkkkk knp jadi ikan sama sambel ??? sumpah bikin gw ngeces ngecesssss. Kalo suka masakan pedes, harus cobain sambel panggang pe. Sambel plus jeruk nipis (atau limau ya) bikin nagih, meskipun pedesnya juga luar biasa.